Vaccination. Well people may no longer think when hear this word. Vaccination is so familiar moreover for now when life style is getting bad and complicated. It used to protect us from any disease by building our body immune. Basically, all life creatures should be vaccinated because the disease infection is getting serious and stronger. There are so many recently diseases that attack life creature which is it can be transferred each other object. now, animal’s disease can also infected human too so that’s why vaccination should be done not only for human but also animal. Talk about disease, basically cause of some disease is not only by bacteria. Something like fungal and virus also caused some disease. Related to something that mentioned before, let’s say like avian influenza case which is it can be transferred, infect human, and become serious issue for some countries in the world. Now, as we know it can be prevented by vaccination. But the question is, which one we need to vaccinated first if we have a poultry? Which one is animal poultry? Well duck, chicken, and some bird which rise for industries generally called as poultry animal. 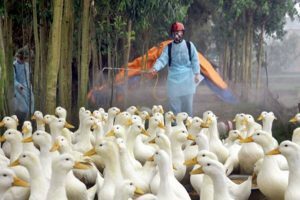 The issue about which one we need to urgently vaccinated first between poultry animal appeared after the information of the duck has better immune than another poultry animal. That’s means that they almost don’t need to be vaccinated because of their good immune condition. But in the fact, that’s statement is a mistake. Here are some important reasons why ducks must be vaccinated no matter how their power immune or another (un)believable words behind it. Speak up about how great an immune of a life creature is too arrogant. People didn’t make their immune so how they can be sure that some immune is great or not. It may know by the duck which often sick, but is it enough to make the speculation? In the fact, basically there is no life creature that really invulnerable over some disease like virus except that life creatures proved that they are invulnerable over that virus. By another word, if the duck is invulnerable over avian influenza well it still be free from the virus. And, how about another virus? There is not only one virus in this world, isn’t it? It is great when the duck is invulnerable over one virus but how with another virus? Is it automatically free? It doesn’t think so. So that’s why even the duck is invulnerable over one virus, it still needs to be vaccinated because the duck can’t be free by all virus. Also, usually vaccination is so specific and used to one kind of virus. So, to prevent them by another virus, it needs to be vaccinated as suit as which one the virus that is threatening them. Let’s say the duck is already invulnerable and automatically free from a virus. And now the question can we know when that the disease come and getting stronger? It can face when the immune of the duck is low mode, right? So, who will guaranteed that the immune is always strong and it can beat the disease or the disease is getting strong and the immune isn’t develop? The answer is nobody knows. Who people that don’t want to give the best for their pet. Both the farmer and the owner have same goal when they treat the duck. Moreover, the farmer who obviously need to produce quality product of cattle or eggs of the duck. As mentioned before that the disease can caused not only by virus but also bacteria and fungal. Each of three caused of disease can’t monitors at the same time. We can’t focus to beat the three of them. When we focus to face the virus, may the bacteria is getting stronger and so does fungal. Even we try to handle the cleanliness in the cage, still we can’t make sure that the cage is free from any bacteria or fungal. That’s because of the shape of bacteria or fungal is microscopic which is we can’t see them by bare eyes so that’s why quality control that we give to our pet is also can’t totally make sure guaranteed. The treatment that we give to our pet isn’t only the right eat, the nice water drinking, or the great house. It also about how can we build the cleanliness of their cage so even we can’t make sure that the cage or the body of our duck is totally clean, at least there is effort to keep it clean. Also, not every bacteria is parasite, there are some good bacteria which needed by life creature. So, face the bad one. Same eyes, same face, same body, and same kind, or even birth as same as duck each other, in the fact, not every duck has same ability when respond something. Respond here means all their ability both to respond vaccinate, respond the disease, and respond our meaning are totally different. There are some ducks that does naturally un-responded over a virus but there are not. There are some ducks which really need a long time to heals of any disease but there are ducks that really quick treatment duck. Also, you may already vaccinate the duck but he still easy to catch by any disease. And, by this case who will take responsibility? Of course, we are as the owner or farmer of the ducks. Who will treat the duck that it is not us? And then, the conclusion of this point is the respond of duck over disease caused by virus, fungal, or bacteria is different each other even they are from same parents. By this diversity, the vaccinated duck is still had a chance to infected by any disease so how the unvaccinated one? It is getting worse, right? That’s all some reasons why vaccination is important for duck. The conclusion that we can get by this information is no matter how great immune that own by some life creature, if the time for sick they sick. So, we better do prevent action not to erase the disease but to protect the individual. We can’t control the disease, all we can do is how we can build strong prevent in order to make the disease lose by our immune. Please deal with the concept that we can make sure when the disease is come and getting stronger and is it the immune of the duck is ready to face it all. That’s the main thing that every farmer and owner should to know. This issue also become serious issue because the disease able to infect human. It is surely terrible because some of them is dead, not only infect each other but this virus also infected human. So, can you imagine how strong the disease it is and how important vaccinate it is?